Gravers are top-load tools that leave a mark on the surface, but don't cut through (see tool details below). Cutters are top-load tools that can cut all the way through the material, or a portion of it (see tool details below). Mills are bottom-load tools that are for taking out large amounts of material. Usually these are used on milling machines, but they can also be used on some of the larger engraving machines. long endmills 100% carbide and extra-long for use in milling machines such as the Roland MDX series and some of the larger EGX series models. The metric and inch-measurement tools below are generally in stock. standard endmills below are designed for use on both milling machines and engraving machines like the Roland EGX line. These are Roland OEM'd endmills - pricing is based on Roland's list. Please call on pricing on these, and for sizes which aren't on our list. twist mills Twist Mills are bottom-load or top-load tools for wax. They have a long twist for removing wax particles from the cut zone. There are two types of knobs available for gravers. The older standard-threaded graver (all manufacturers other than Roland) and the Roland knobs. 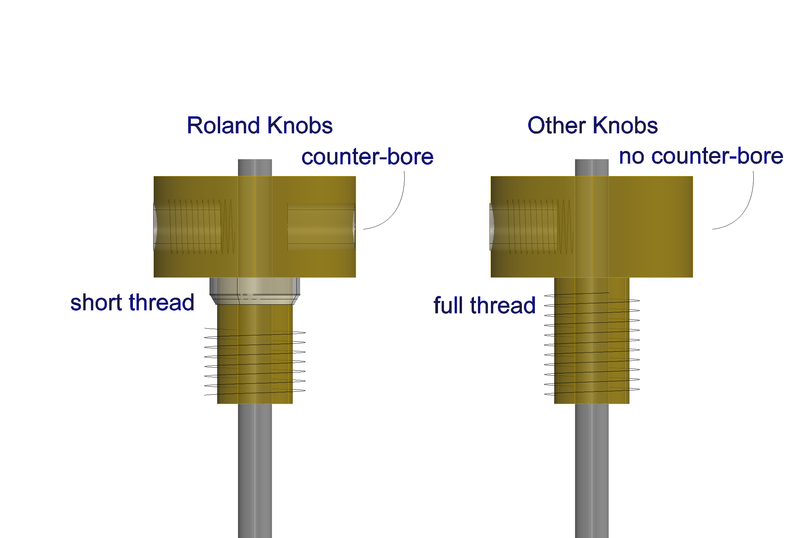 The Roland knobs feature a counter-bore and tapered head/shorter thread. The 11/64 tools are generally interchangeable with Roland and other manufacturers. 1/8 and 1/4 are not interchangeable. Standard Flex Carbide IN STOCK Standard 30° carbide cutters for use on plastics and wood. Rotating Diamond HSS Diamond IN STOCK Diamond tipped HSS cutters: Glass, Burnishing, Anodized Al. ADA Braille Dot Carbide IN STOCK Carbide tools for cutting out braille dots. Rubber Stamp Carbide SPECIAL ORDER Carbide cutters for engraving rubber stamp matrix material. Pen Diamond Diamond SPECIAL ORDER Diamond tipped cutters used on bare and epoxy-coated pens. For Roland EGX-series users: The Roland Japan standard graver selection and Roland US standard graver selection have their own numbering systems and have different respective subsets of the graver list here. To order Roland equivalents, check the graver code in the table above and reference the appropriate Antares AC, AS, or DG stock code. All prices include the standard Roland brass knob, with the exception of burnishers which don't require the knob. All 11/64” carbides are at minimum “carbide tipped” as per Roland specs. 3DTechnics upgrades this to full carbides where possible.